Lip balm is my best friend all year round, but in the wintery months I always make sure I have one to hand 24/7. So, which is best? Mei from Reviews.com provided me with a really useful, in-depth report on what's good in a lip balm, and what to avoid. Although the lip balms that I use daily and will talk about in this post aren't mentioned in the report, they still fit the bill of wholesome, good quality lip balms with ingredients that will genuinely improve your lips rather than mask the discomfort. Some of the products mentioned in the report aren't cruelty-free + vegan, but I'd really recommend giving it a read to improve your knowledge. If you apply lip balm as often as I do, it's not only interesting but also really important to know what's going on to your delicate skin on the daily. 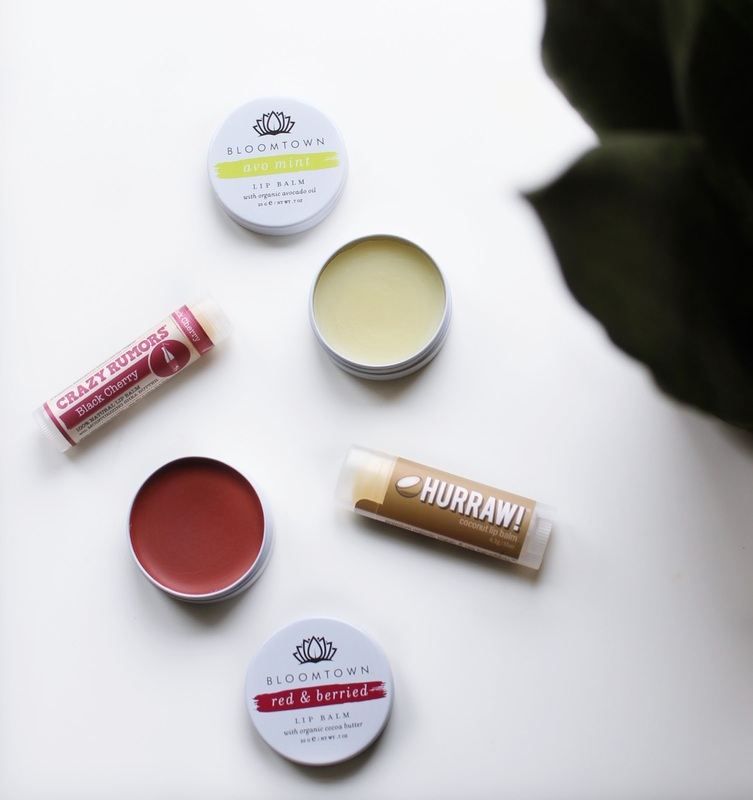 These four lip balms are what I've been using recently to prevent the chapped lips situ: all affordable for my measly student budget, all vegan, all cruelty-free and all-natural. Lovely! 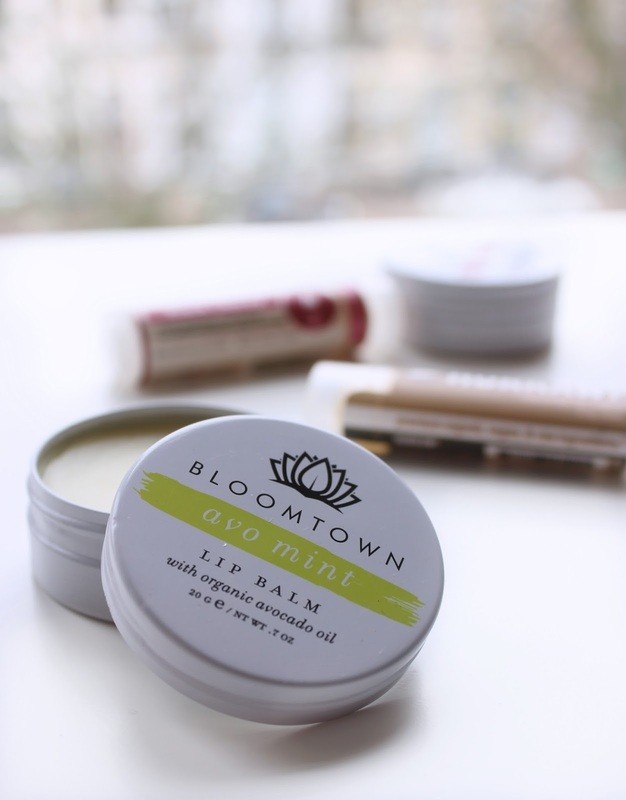 Recently Bloomtown had an offer that let you try one of their new vegan lip balms for free, and another for half-price. Bargain! After ten days of use, I already know I'll be repurchasing one of these once I run out. The avo-mint scent (scent? flavour? who knows with lip balm) is a hydrating and refreshing pot to dip into - the peppermint oil giving you a slight tingle but unlike medicated ingredients - this won't cause more damage. Always a fan of a punny name, I also love the formula of this lip balm. This leaves a very subtle sheen on the lips, so you can dab it on top of a matte lipstick to make it more comfortable (I have no patience for matte in winter) or pop a colour on top. Its power as a lip balm is great too - the scent reminds me of a Body Shop strawberry lip balm I had when I was in school - it's a real delight to apply it as it smells so sweet. The Crazy Rumors lip balms are well known and well loved in the cruelty-free community, and for good reason. A really nourishing and moisturising balm that comes in a huge variety of scents, in the easiest form of applicator. This is the first one I've ever tried, but I've had it for a good few months and it doesn't seem to be running out any time soon. I'm surprised I haven't lost it yet honestly. I feel as if Hurraw are a close runner up to the Crazy Rumors clan and I picked this up on a whim in a health food shop. As soon as I'd bought it, I was told via Instagram stories (by @sounthie) that the moonbalm version has a better formula - so I'm really excited to try that! So far I've been a big fan of the coconut version though, it's such a comforting but gentle scent and feels soothing on the lips. So now you know what's rattling around in my backpack, handbags and pockets at all hours of the day, and if you're in need of a new lip balm to add to your own collection, I'd really recommend one of these. Christmas is coming, and if I were to receive either of the Bloomtown balms in my stocking I'd be very grateful to Santa for it! I actually feel as if my lip balm collection isn't large enough in proportion to my huge adoration for the stuff, so if you have any recommendations of your own, please let me know! I would like to personally congratulate you as your blog Just Deenie has been selected by our panelist as one of the Top 100 British Beauty Bloggers List on the web. My lips crack and dry all the time. I'm looking for a balm that moisturizes my lips. How long does the balm last?